Long time readers will remember my fondness for The Fern as well as its spectacular fall from grace when it changed owners. It should be no surprise then that The Fern is no more. Café Oratnek has taken its place and with it comes a flair of Japanese influence. And well it should as Kentaro ‘Kenny’ Takayama (so do you see now why it’s called Oratnek? 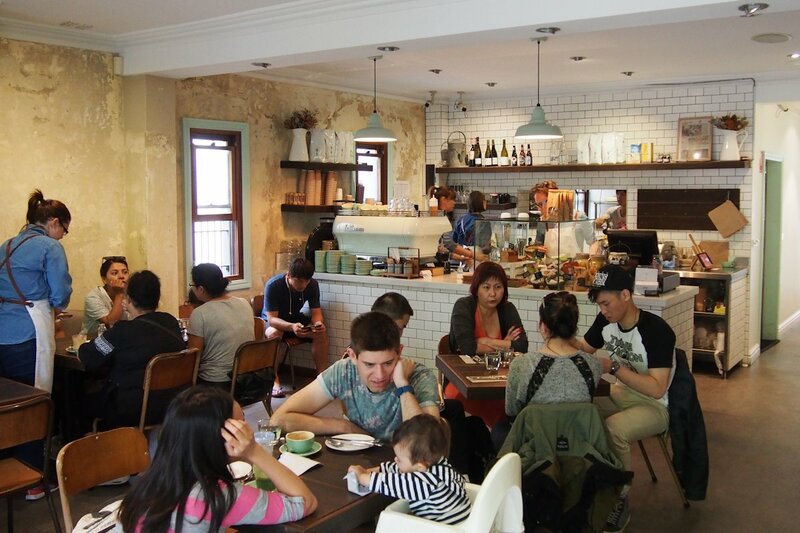 ), the head chef from Bills in Darlinghurst has finally made his childhood dream of owning a café, a reality! It was just fortuitous timing then (as well as an encouraging wife) that Kenny drove by the location and decided that it was time. Daryl Russell has come along for the ride as general manager, previously at Centennial Parklands Dining. The front courtyard and herb garden has received a refresh as part of the renovation. 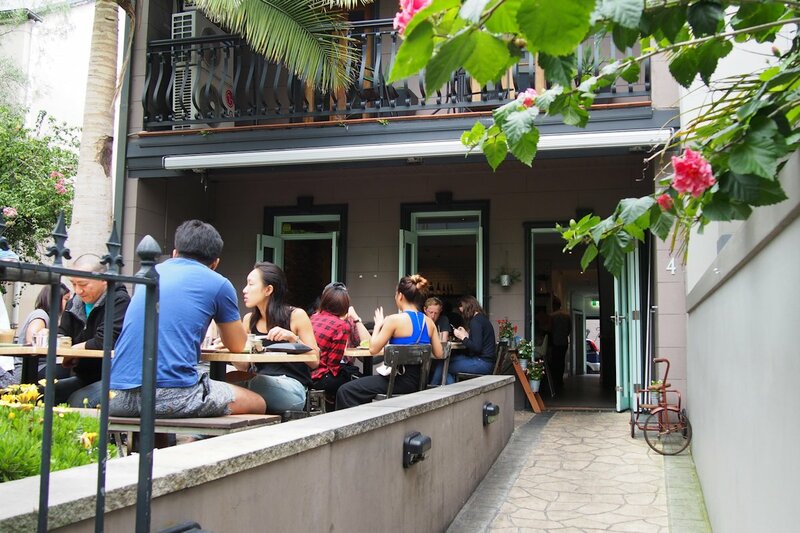 It’s one of the most laid-back breakfast environments around thanks to the lush foliage and quiet street. The interior also has a new fitout too. While it’s partly rustic with exposed walls showing exactly what was underneath when they were scraped back, the rest features clean white subway tiles; a great offset to one another. The Service was a strange combination for me. While the waitstaff were prompt, courteous and professional, there wasn’t a hint of warmth or much interaction. So there definitely wasn’t any rudeness but interactions were slightly abrupt. 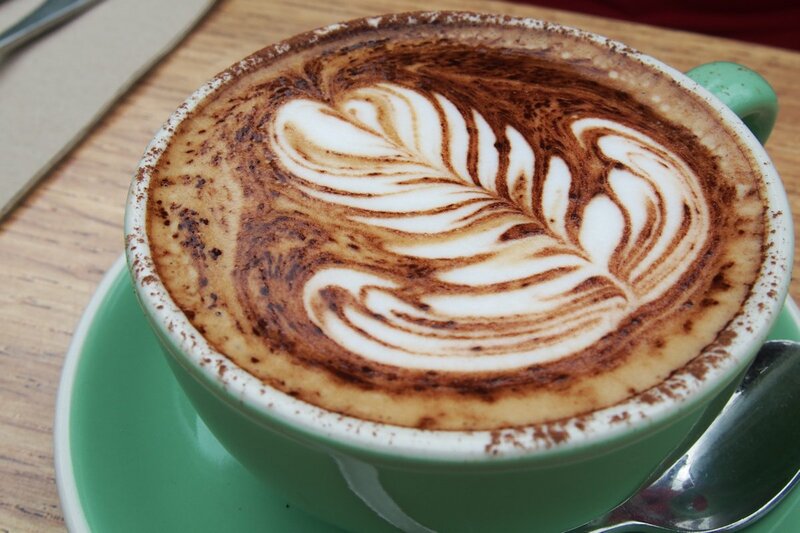 The coffee ($3.50) was reasonable and presented well but too milky for both my and my guest’s tastes. 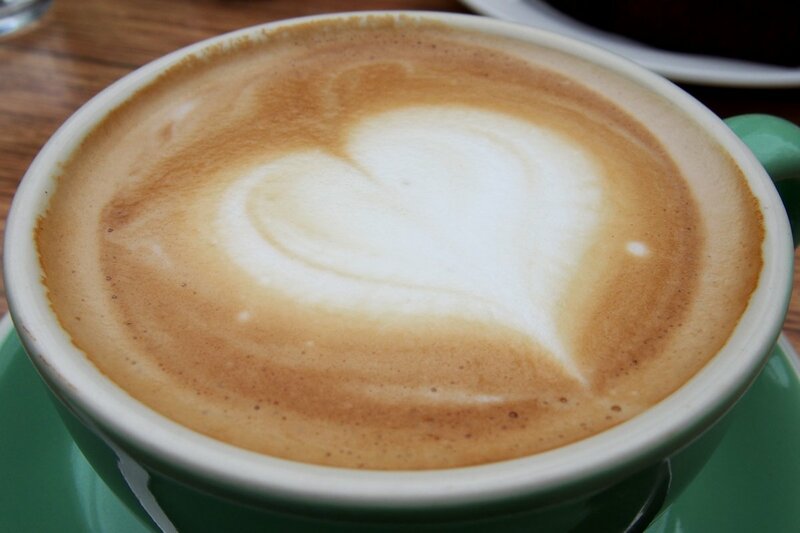 I think that the blend needs to be a bit more robust or you should order any coffee with milk as a 3/4. There are plenty of other beverages including iced coffee ($5), iced mocha ($5.20), affogato ($6.50), thickshakes ($6), fresh juices $6),the bloody samurai ($13) and housemade soads such as minted lemon lime bitters and fizzy rhubarb ginger beer ($6). The Japanese flavours were evident in the food immediately. 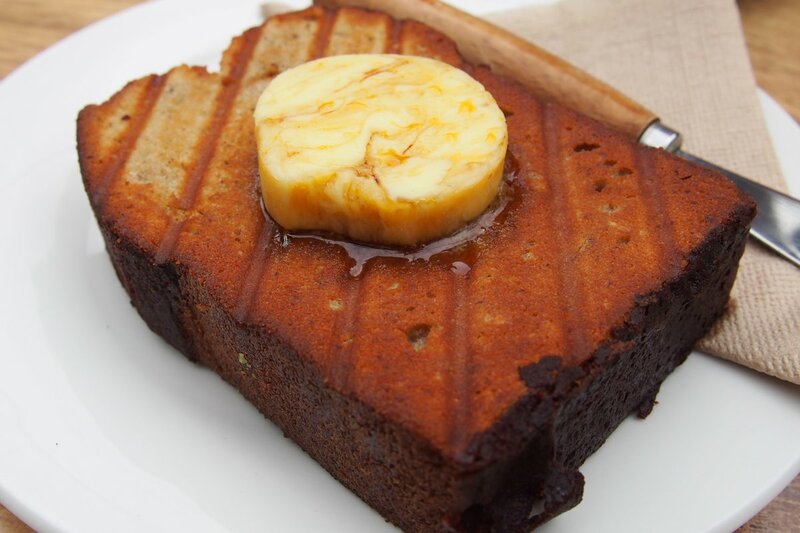 The banana loaf ($5.50) is served with kuromitsu (sweet and similar to molasses) butter. It’s a different but well-matched combination. I admit that we spread the entirety of it on our hot slice! 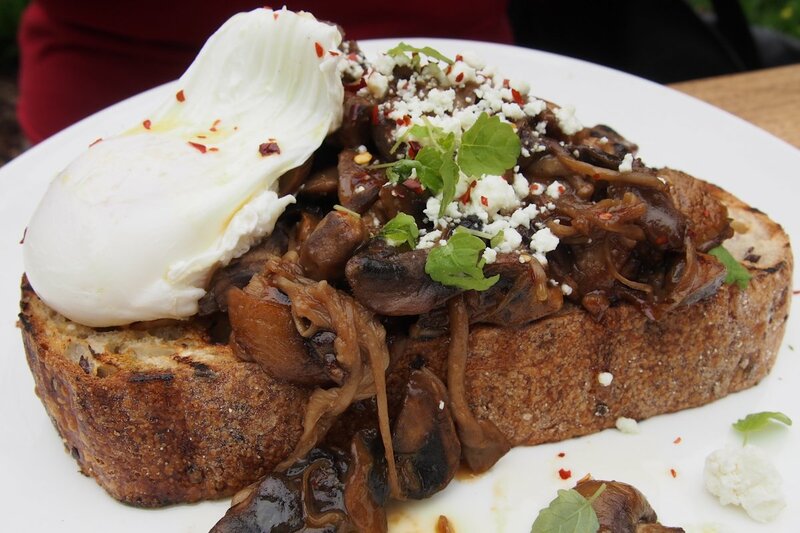 For the great price of $14 (or $16.50 with a poached egg, the sautéed mix of wild mushrooms is one of four different “on toast” combinations. With a plethora of mushrooms, all seared with miso, butter and herbs, the slightly savoury, slightly sweet flavours abound. The smoothness of the goats cheese crumbled on top subdued some of these flavours and the organic unbleached sourdough beneath (supplied by Brickfields) soaked up the juices wonderfully. 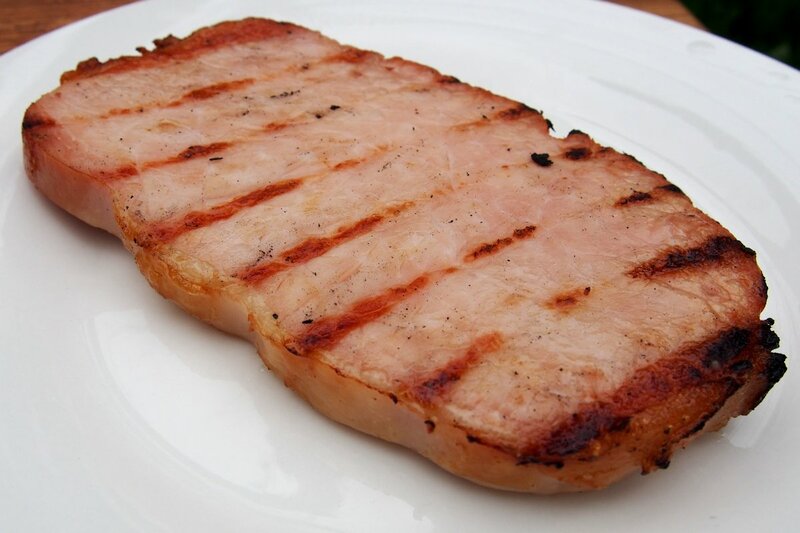 While no bacon is on offer, you can order a side of thick grilled ham steak ($6) which is also slightly sweet but the chewy meat worked wonders with the mushrooms. 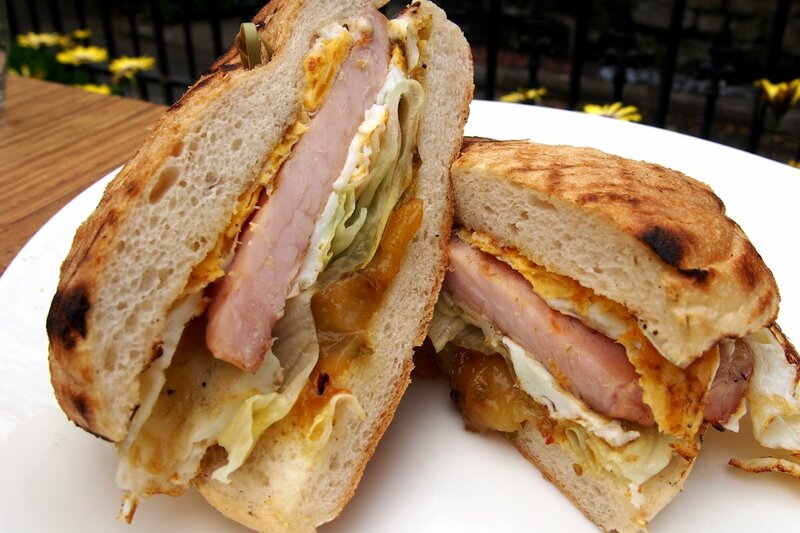 The thick bacon & egg roll ($12) adds some unusual ingredients compared to what you would normally expect. There’s a spicy mango chutney (which isn’t hot but does have spices, some nice hints of coriander seeds especially), lettuce and mustard mayonnaise. My one quibble is that I would prefer the egg to have been runny so I’ll request that next time. Other dishes worth trying include nuts, grains, seeds, fruits (lightly toasted granola, poached fruits, honey, yoghurt, milk, almond milk & juiced apple bircher muesli, yoghurt, $12), mashed 4 spring peas & beans, jamon serrano, spinach, kale, parmesan on toast ($14) and matcha French toast, banana, coconut, strawberries, matcha mouse ($15). The lunch menu also looks amazing. Oratnek is making a name for itself in the area for its matcha lamingtons and muffins too so be sure to leave room for something from the counter. As much as possible is made in-house including all desserts and pastries. It’s refreshing to see a menu with flavours and combinations that not only do you see rarely, but also nowhere else at all! Overall, it works and at very accessible prices in a superb setting. This entry was posted in Sydney - CBD, Sydney - South and tagged Disabled access, Dog friendly, Free range eggs, Gluten free options, Outdoor seating, Parking close by, Reasonable prices. Bookmark the permalink.